Often, people use words such as ‘the Dow’ and ‘NASDAQ’ in a similar connotation failing to understand that both are different. Dow Jones Industrial Average (DJIA) refers to a stock market index whereas NASDAQ is an electronic exchange system that stands for the National Association of Securities Dealers Automated Quotients Exchange. NASDAQ also refers to an index. Hence it is used in two different ways i.e. an exchange and also an index that presents a certain portion of the market. here we discuss the NASDAQ vs Dow Jones. NASDAQ is the largest electronic stock exchange in the world by Market capitalization after the New York Stock Exchange (NYSE) in the USA. NASDAQ was established in 1971 as a successor to Over the counter (OTC) trading. It has the highest trading volume as compared to any other exchange in the world. Because of this highest trading volume, it suffers from volatility as compared to other exchanges. NASDAQ Inc. is the owner of an exchange platform. It also owns and operates some stock exchanges in the European markets. NASDAQ Inc. was recognized as a stock exchange by the Securities and Exchange Commission (SEC) in 2006. Dow Jones is a financial and business news company. Although the Dow Jones Industrial Average tracks the publicly listed companies Dow Jones itself is not a publicly traded company. It was founded in 1896 by Charles Dow, Edward T. Jones, and Charles Berkstresser. The DJIA is the stock index that tracks 30 large publicly owned companies in the USA traded on NYSE and NASDAQ. 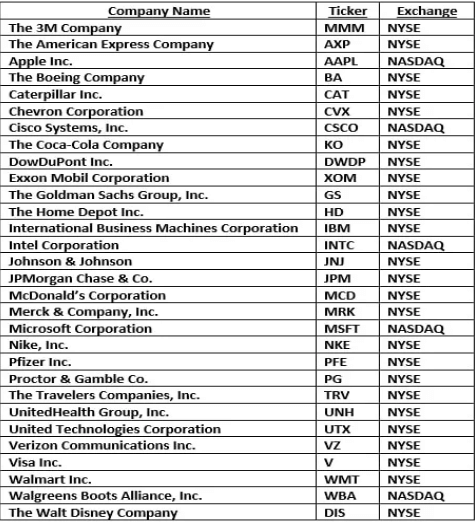 The above screenshot provides the list of 30 companies on the Dow Jones Industrial Average. The ratio between NASDAQ vs Dow Jones gives us an interactive chart. A high ratio is an indicator of the fact that the market has gone frenzy and a high bullish sentiment is prevalent. It is also an indicator of the fact that the economy is faring well. Below is the chart from 1977 till present presenting the ratio of both the indices. These ways of trading on NASDAQ vs Dow Jones are via ETFs and Index Funds. Index Funds are constructed to track a particular index for instance NASDAQ 100 etc. Investing in an index fund is a passive style of investing the returns are maximized by reducing the buying and selling of stocks frequently. It is an efficient method to reduce operating expenses. Since the fund replicates an index hence the need for research analysts and other related expenses is done away with. Even Warren Buffett recommends investing via Index funds and classifies these funds as a safe haven for retirement. He also says that the performance of an average index fund will fare well as compared to the performance of the most active managers. NASDAQ mainly comprises of companies in the technology sector or the companies in the growth stages while Dow Jones is more about the stock price and is hence dependent on the earnings. If the stock price drops, less weight will be given and the stock may no longer be a part of the index. Global Select Market –The NASDAQ Global Select Market has the highest initial listing standards of any exchange in the world. 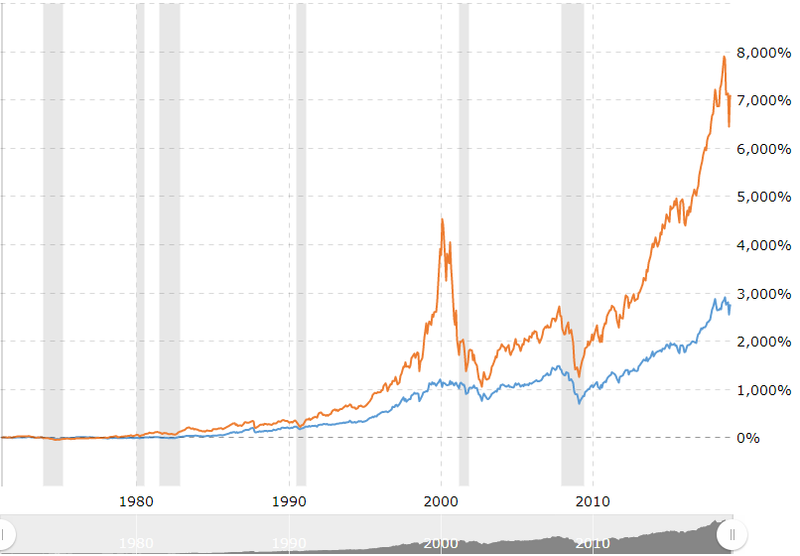 NASDAQ vs Dow Jones refers to market indices but it should be noted that an investor can only buy and sell stocks on NASDAQ since it is an exchange also where the stocks can be bought and sold electronically. Moreover, these indices cannot be traded as they only represent a certain set of stocks on the basis of certain criteria as we looked in this article (price-weighted and Market capitalization based). The ways of trading are through Exchange traded funds or index funds. This has been a guide to the top difference between NASDAQ vs Dow Jones. Here we also discuss the NASDAQ vs Dow Jones key differences with infographics and comparison table. You may also have a look at the following articles to learn more.